Corn on the Cob Curry. I’ve long seen many parallels between Indian and Mexican cooking: the layering of complex spices, the love of chiles and beans, the vast diversity of regional cuisines – and plenty of misconceptions on the part of outsiders. Maybe that explains why, when I first tasted the results of an Indian recipe I tried recently, I thought: It’s crazy corn! You know, the fantastic classic Mexican street snack elote loco: a grilled cob slathered in mayo, rolled in cheese and sprinkled with ground chile and lime juice. 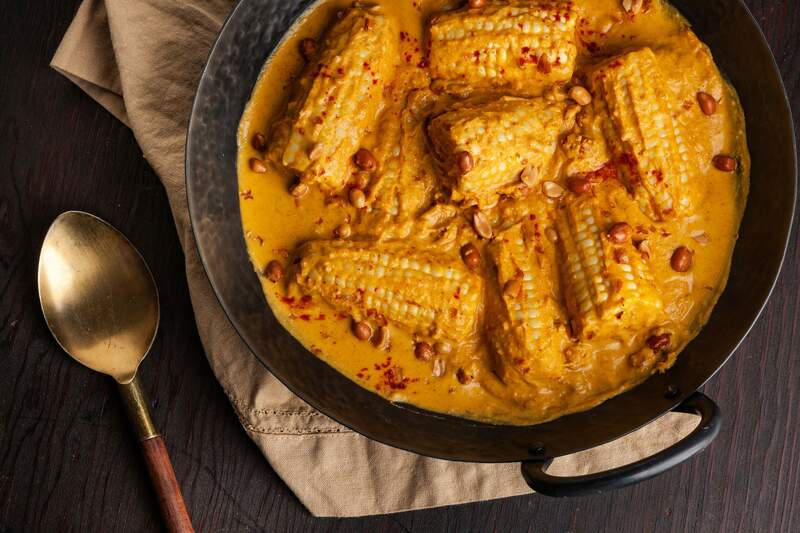 Similar treatments are popular in Central American countries, while American chefs have taken great liberties with the dish, changing up the sauce and spices and adding other crunchy bits to the corn. At first glance, the dish of Corn on the Cob Curry I made, a recipe featured in Meera Sodha’s “Fresh India” (Flatiron Books, 2018) and from Gujarat state, seems nothing like any of those. These cobs (or half-cobs, actually) nestle in a thick, creamy sauce made from ground peanuts, chickpea flour, yogurt and spices, with whole peanuts on top. And you eat them with flatbread or rice. But when I picked up a cob, scattered even more peanuts on it and took a bite, the comparison was impossible to avoid. It was messy and crazy-corn wonderful. For what it’s worth, if the mess bothers you, take note of the fact that elote is sometimes served with the corn kernels cut off and tossed in its coatings instead. I tried that with this recipe after my first couple of cobs, and it was delightful that way, too, though perhaps not quite as crazy. If you can find only salted peanuts, reduce the added salt in this recipe to ½ teaspoon, before tasting and adjusting. You may also substitute the nuts with ¾ cup natural peanut butter.Serve with rice or flatbread.Ingredients:6 ears corn, still in their husks1 cup unsalted peanuts, preferably red-skinned for visual appeal, plus more for serving (see headnote)5 tablespoons canola oil¾ cup chickpea flour1 cup plus 2 tablespoons plain whole-milk Greek yogurt (may substitute low-fat)1 teaspoon kosher salt, plus more as needed (see headnote)½ teaspoon ground turmeric1½ teaspoons ground red chile, such as Kashmiri1 teaspoon sugar2½ cups water, or more as neededMethod:Dip the corn cobs, husks and all, in water until thoroughly moistened. Microwave on HIGH until very hot, 10 to 12 minutes. When they are cool enough to handle, use a sharp knife to cut crosswise through the husk and cob an inch or two from the wide/stem end (opposite from the end with the tassel of silk). Hold the silk end, then push the corn cob out the other end. Discard any stray silks. Cut each cob in half. Place the peanuts in a dedicated spice grinder or food processor; grind to a fine consistency. Pour the oil into a large skillet over medium heat. Once the oil shimmers, add the chickpea flour, whisking to smooth out any lumps (forming a kind of roux). Cook until slightly darkened, about 4 minutes. Add the ground peanuts; reduce the heat to medium-low and cook, stirring frequently, for 5 minutes, until the mixture is the consistency of thick peanut butter. Whisk in the yogurt, salt, turmeric, chile powder and sugar. Increase the heat to medium and gradually ladle in the water, whisking until smooth. Taste, and add more salt, as needed. Nestle the ears of corn into the sauce, reduce the heat until the sauce is barely bubbling, cover and cook for 5 minutes, until the sauce is the consistency of heavy cream. Add more water as needed to loosen the sauce. The sauce will continue to thicken as it sits (and if you refrigerate leftovers), so you may need to whisk in more water still when you reheat. Transfer to a serving dish or individual wide, shallow bowls, scatter more peanuts over each portion and serve. Source: Adapted from “Fresh India: 130 Quick, Easy and Delicious Vegetarian Recipes for Every Day,” by Meera Sodha (Flatiron Books, 2018).